We are known for offering excellent Insulation Service for Buildings to the customers. These services are widely used to cater to various domestic and industrial requirements of the clients in the most efficient manner. Our experts provide a secure & safe internal wiring inside the walls with protection insulation coating through these services. Savings in Energy Costs : XPS Thermal Insulation helps save energy costs in a building as air-conditioning loads will be lower & cooling effect is retained longer in an insulated building. Living Comfort Inside the Building : XPS Thermal Insulation helps provide a comfortable living inside the building by providing a thermal -01 barrier against heat conduction, suppressing air movements to limit heat convection & limiting heat radiation effects. 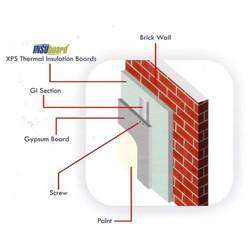 Enhanced Life of the Building Structure : XPS insulation enhances the life of the building structure by providing protective insulation and thereby preventing the formation of cracks due to thermal expansion-contraction stresses which occur when a building structure is exposed to sunlight. XPS also helps in extending life of terrace waterproofing. Looking for Insulation Services ?